Hello again friends, and back to business. Well, almost. 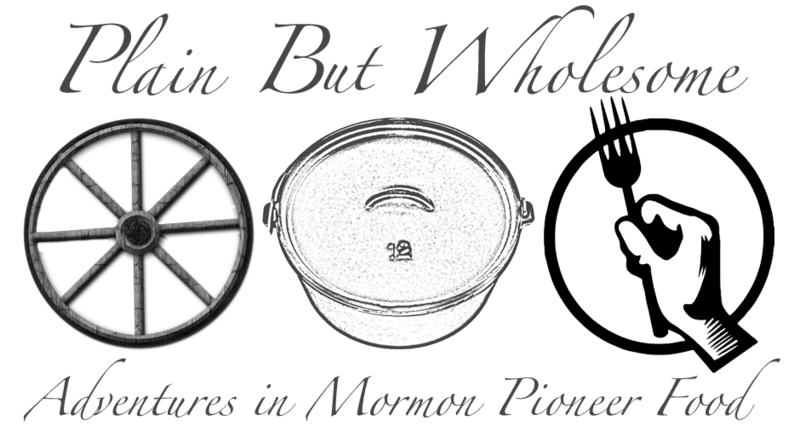 As you know I mostly concern myself with Mormon Pioneer foodways. For me, that means post-Nauvoo exodus (1846) and pre-railroad Utah. Naturally there will be some fudging on the margins because conditions in Utah's Dixie didn't change much for years after the railroad went through northern Utah. Today's observations come from the other end: Nauvoo. Recently Deseret Book published a tidy little book called The Emma Smith We Know. This is a collection of anecdotes and receipts that have been handed down orally and on scraps of paper among the descendants of Emma Smith. Generally these were not part of the Mormon Migration, since Emma stayed in Nauvoo when most others went West. Naturally this is just the kind of stuff that gets me excited, but since it falls outside the arbitrary time period I set for myself, I can't put it in the book. Plus, someone else already put it in their book. Hmmph. Emma's grandson Frederick Alexander Smith said the "candidates" were served with honey or syrup. "During the big political campaigns several candidates came to the Mansion House hotel for dinner and Grandmother made fritters, at the end of the mea with honey or syrup. Delighted-- politicians asked, 'What do you call these things?' She said, 'It all depends. A year like this we call them Candidates-- all puffed up and air in them'"
Sift flour, baking powder, sugar and salt together. Make a well in center of dry ingredients and pour in milk. Add lightly beaten egg youlks. Blend together till batter is smooth. Fold in stiffly beaten egg whites. Chill for 30 minutes. Form into fritters by making balls with 2 spoons dipped into hot water. Deep-fry in oil until golden brown. A fritter is basically a small deep fried morsel of something. They could be apples, bananas, savory meats, etc. The fritter described here seems to be remarkably similar to a Danish aebleskiver, but is deep-fried in lard rather than using the traditional Danish pan. They might also be compared to a dumpling, but lighter. Just goes to show, its impossible to invent a new food; we just reshape the old ones. As for interpreting this "historic" recipe, it has clearly been altered since Emma made them. As we noted in previous posts (see the doughnut discussion), baking powder was not invented or widely used during the Nauvoo house era. In Emma's day it would more likely have been a saleratus or pearlash leaven (i.e. baking soda), using sour cream, buttermilk or vinegar as the reacting agent. In Miss Eliza Leslie's Directions for Cookery, In Its Various Branches (1840), a similar receipt is given for "plain fritters" but has no leaven included whatsoever, relying only on stiffly beaten eggs, cooked immediately as the batter has a tendency to fall over time. No. Do not make vinegar pie. My family will not let me live that down. Truly, this is fair warning. As for the fritters, that shall be FHE treat tonight. Made with blueberries and topped with honey butter. Mmmmm.